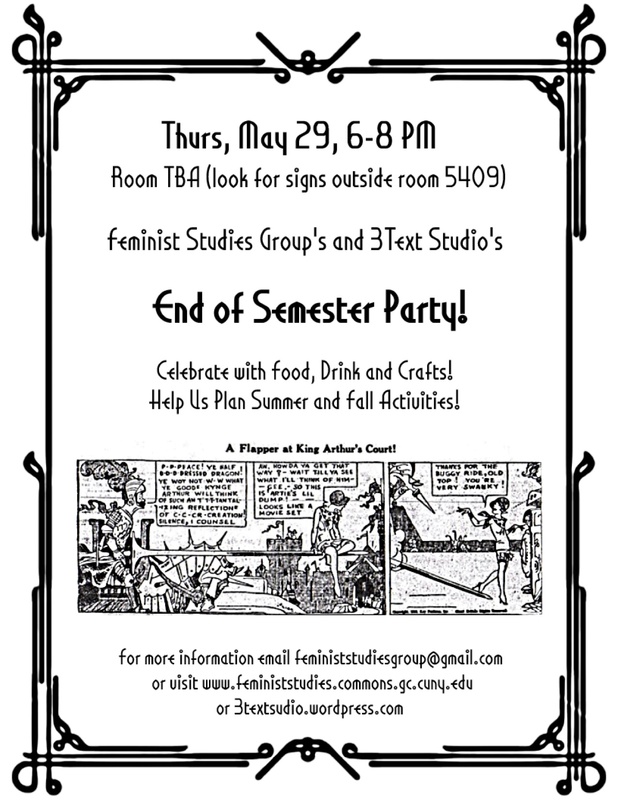 We’re having an end of semester party/gathering/loose planning meeting with crafting support from our friends 3Text Studio! 6-8pm near room 5409 (look for signs!). Hope to see you there! If not, have a great summer!! 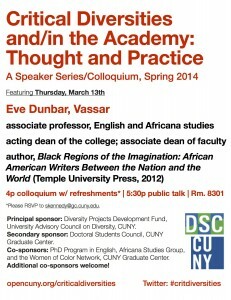 March 13th, 2014 · Comments Off on Today, March 13: Eve Dunbar kicks off Critical Diversities and/in the Academy! Hoc Committee Against the Militarization of CUNY, the Revolutionary Students Coordinating Committee, and the organizers and supporters of “The War Here and Abroad: CUNY and U.S. Empire” panel discussion. Intellectual Legacies and Activist Practices,” last summer’s Georgetown report “Separate and Unequal: How Higher Education Reinforces the Intergenerational Reproduction of White Racial Privilege,” and Sara Ahmed’s 2012 book ‘On Being Included: Racism and Diversity in Institutional Life.’ The guiding questions are two-fold: How can we meet the critical need for diversities in higher education, and how does this need impact the work we do as scholars and practitioners/activists? Her appearance is co-sponsored by the PhD program in English, the Africana Studies Group, and the Women of Color Network, CUNY Graduate Center. details on the next three speakers, please visit opencuny.org/criticaldiversities. For questions, co-sponsorships, or to RSVP for the colloquium portion of the Dunbar event, please email skennedy@gc.cuny.edu. DATE CHANGE!! Screen Printing Workshop now on Monday 3/24! March 7th, 2014 · Comments Off on DATE CHANGE!! Screen Printing Workshop now on Monday 3/24! Due to a scheduling error, FSG’s International Women’s Day Women’s History Month Screen Printing Event at Gowanus Print Lab has been moved to Monday, March 24. Event time and place are the same, 7-10pm. T-Shirts will be provided. We are working on getting tote bags! 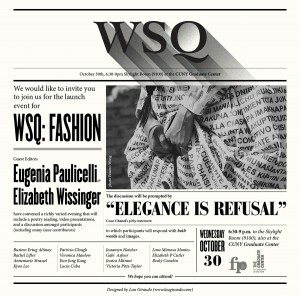 The event is free with RSVP, so RSVP HERE! As always, there will be food and drinks!! We hope you can make it! 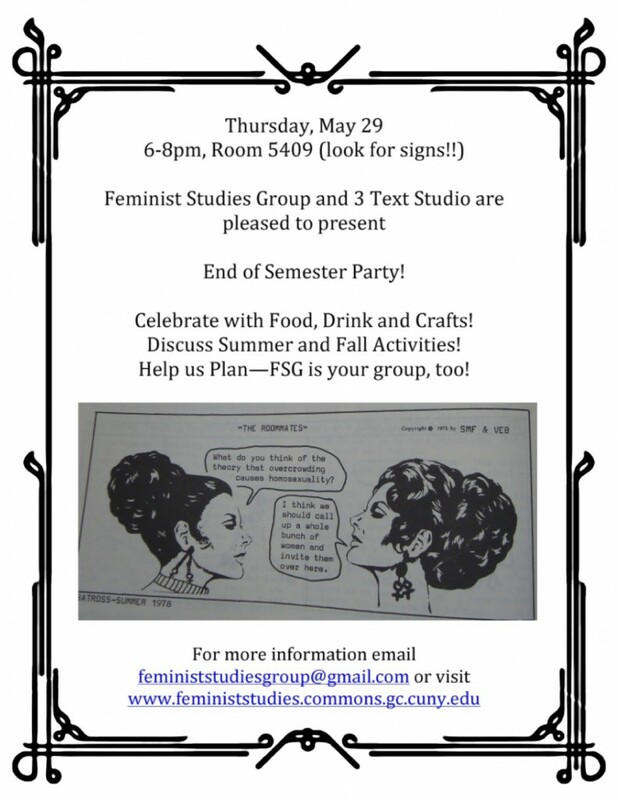 If you would like more information, please email event coordinator, Gwen Shaw, at feministstudiesgroup@gmail.com. Don’t miss out on today’s great double header events! 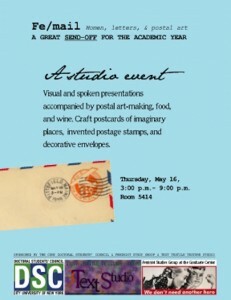 @3pm: Fe/mail: Women, Letters, and Postal Art, from 3-9pm, co-sponsored by 3TextStudio! 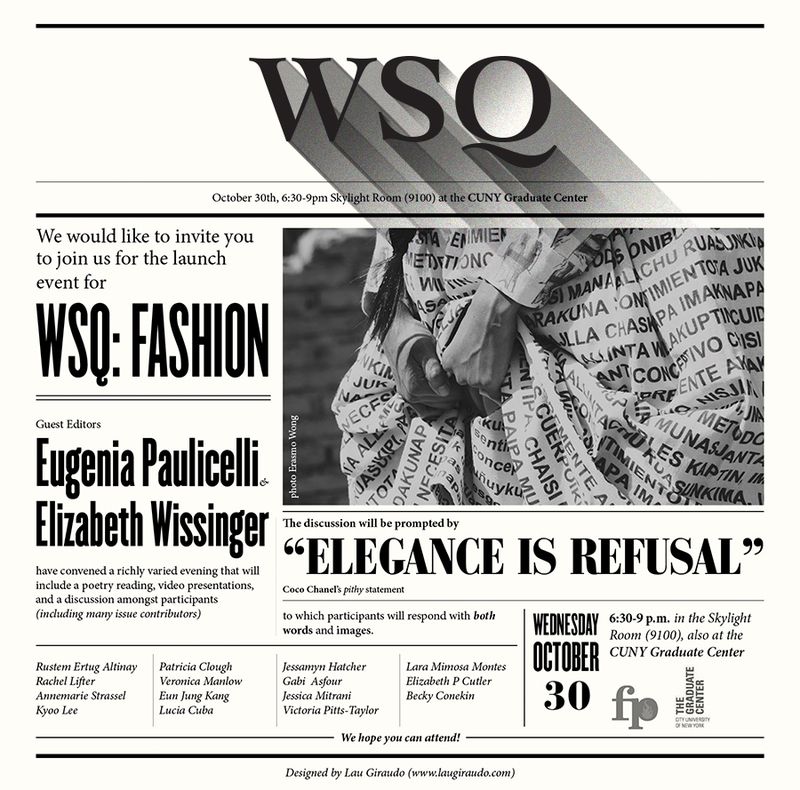 All events in 5409/5414 at the Graduate Center (5th floor). Want to teach Women’s Studies? May 9th, 2013 · Comments Off on Want to teach Women’s Studies? Thinking about teaching in Women/ Gender/ Sexuality Studies? Wanting to learn how to enhance and bring multiple disciplines to your CV, find jobs, and develop critical feminist pedagogy in the classroom? Join the featured panelists, Rupal Oza and Jennifer Gaboury in this workshop. Rupal Oza is an Associate Professor in Earth & Environmental Sciences, and the Director of the Women and Gender Studies program at Hunter College, CUNY. Jenifer Gaboury is a Lecturer in Political Science the Associate Director of Women and Gender Studies program at Hunter College, CUNY. 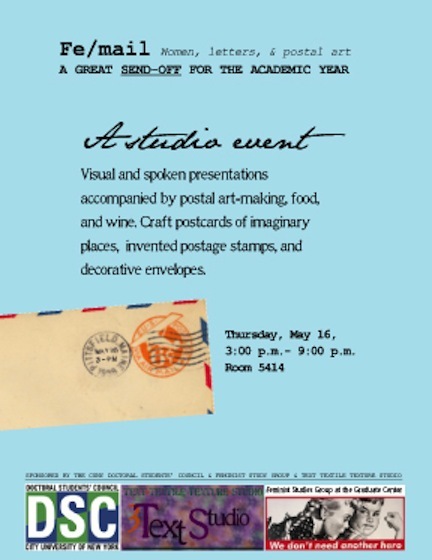 Thursday May 16, 3-9pm, explore the history of mail art and create your own postal or epistolary craft potential!